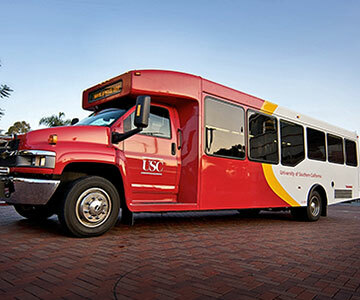 USC Transportation recognizes the importance of meeting the transportation needs of the campus without compromising the health of our students, employees, or the environment. By initiating several efforts with our Transportation vehicles and attitudes we know we continue to search for new ways to cutting costs while going green. All of our buses operate on alternative fuels. We currently operate 13 bio-diesel buses, 1 CNG bus, and 11 propane buses. Impact: Both Diesel and Propane fuel are safer than gasoline because they are non-toxic and do not compromise those living in our community or the environment. Biodiesel fuel reduces toxin compounds by 75-85%. Propane fueled vehicles reduce greenhouse gas emissions by 18%, and show no visible sign of tail pipe exhaust. We have purchased highly rated green vehicles, including 5 hybrid vehicles, and plan to continue this conversion from unleaded vehicles to hybrid technology. Impact: Hybrid cars produce 80% less harmful pollutants and greenhouse gases than comparable gasoline cars. This translates to less airborne pollutants and a cleaner earth. Maven is a more connected, seamless car sharing experience that alleviates the parking demand on and around campus. 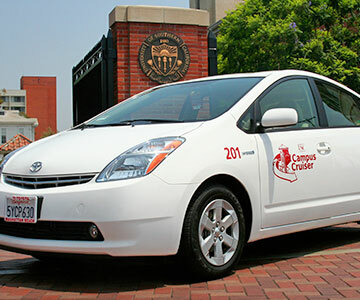 Students, faculty, and staff can rent vehicles parked in 17 locations throughout campus. Impact: During the first six months of offering the Chevrolet Bolt EV in Maven markets in California, more than 1.4 million all-electric miles were driven and an estimated 56,000 gallons of gasoline were saved. 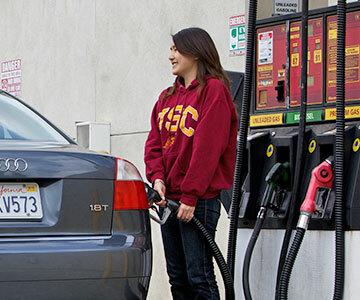 We offer B20 biodiesel fuel to our customers at the fuel station by the Parking Center. Impact: B20 Biodiesel allows unmodified diesel engines to use alternative fuel without modifying the engine. Since biodiesel is not a fossil fuel it can cut greenhouse-gas emissions as well as ordinary pollutants (particularly soot) by displacing petroleum diesel fuel. 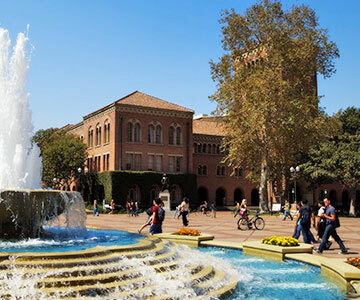 Many USC Employees share the commute to USC’s campuses by participating in private vanpool or USC carpool programs. Impact: Carpool and vanpool riders save money on gasoline, parking costs, vehicle maintenance, and insurance while helping reduce peak-period traffic congestion and emission pollution. 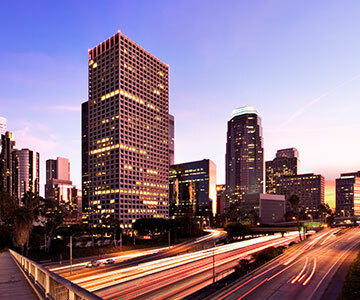 The Clean Air Awards honor those “who have made a significant contribution to cleaner air through innovation, leadership and personal environmental commitment.” USC Transportation is proud to announce that over the last 3 years we have maintained an Average Vehicle Ridership over 1.70.